Wings are a favorite, whether you're planning a party or just dinner for the family. You can use your slow cooker to cook wings through after you brown them in the oven, or you may opt to keep them hot in a slow cooker after they're baked in the oven. Either method will produce hot, delicious wings for your friends and family. Use your slow cooker for wings on busy days, whether you're prepping for a party or at the office. Rinse the chicken wings and pat dry. Place on a broiler pan or roasting pan and broil for 10 minutes on each side until golden or bake at 450 F for 12 minutes per side. Transfer the browned wings and your favorite homemade or purchased sauce to your slow cooker. Cook on high for 4 hours or low for 8 hours, then serve. When you're making wings in the slow cooker, choose a slow cooker the right size for the number of wings you're cooking. A 6 qt. slow cooker can easily accommodate 24 to 36 wings, while a 4 qt. will cook 18 to 24 wings. Allow at least 1 cup of sauce per 12 wings, tossing the wings in the sauce to coat them thoroughly. You can also use your slow cooker to keep wings warm at a party or potluck. Place the hot, cooked wings into a preheated slow cooker. 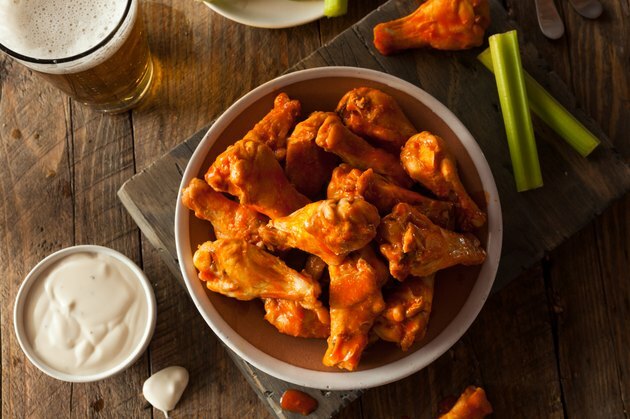 If you're reheating wings you've baked ahead of time, heat them to 165 degrees on the stove, in the oven or in the microwave before transferring them to the slow cooker. Food should be kept at 140 degrees in the slow cooker to prevent the growth of bacteria. To reduce the risk of food-borne illnesses, preheat your slow cooker or turn it on high for the first hour of cooking time, then reduce the temperature to low. Newer models include timers to adjust the setting from high to low or low to warm.